A common question asked in regarding gold is do all of the different colors of gold have the same purity and value? The simple answer is yes. Now we will try to explain how they get their unique colors and what makes them different. It mostly has to do with the other metals alloyed with the gold and we will discuss how this works. Any form of gold other than pure gold (24k) is alloyed with other metals. Alloying is a process of combining two or more metallic elements to give greater strength or resistance to corrosion. For example 10k gold has ten parts gold and 14 parts alloy, 14k gold has 14 parts gold and 10 parts other alloys etc. It is often expressed as a ratio 14/24 or you might see the number .585 (signifying 14k) or 18/24 or .750 (for 18k) on a piece of gold. Interestingly enough there are actually many other colors of gold. Grey gold which is alloyed with manganese, copper, and silver. There is black gold which is created by using black rhodium. The least known is probably blue gold which is alloyed with Indium. However not to confuse you we are going to discuss the two most popular colors of gold, white and yellow. Okay let us start with the basics. Why is gold alloyed with other metals? There are two main reasons. The most important one of course, is price. Gold in its pure form can be very expensive and most people would not be able to afford to wear jewelry every day. The second reason and equally as important, gold is an extremely soft and malleable metal which can be easily scratched or damaged, the alloys actually make the gold stronger and more durable. Yellow gold in 14k combination is usually alloyed with copper and zinc while white gold is normally alloyed with a mixture of Palladium, silver, and Nickel. The white metals create the white color in the gold. Nickel is the cheapest way to alloy white gold however many people are allergic to nickel so silver or Palladium is used instead. Even though yellow gold seems be more pure than white gold so it would make sense that yellow should command a higher price, white gold is often more expensive than its yellow counterpart because it can be harder to fabricate and get that rich white color. In today’s marketplace white gold is more popular and trendy and often demands a premium. However, when it comes to recycling gold for some extra cash they are both worth the same. It’s fascinating to know that the reason white gold became so popular is because our everlasting love for diamonds. When wearing a white gold band it complements the diamond and can make the diamond appear more brilliant in contrast to its yellow gold counterpart that creates the illusion that the diamond appears more yellow than it really is. In the 4 C’s of diamonds color plays a major role in the value and brilliance of a diamond so naturally people would prefer a metal that compliments this factor. When choosing between white and yellow gold, a strong argument can be made to support either side. You can be rest assured that 14k white gold is the same purity as 14k yellow gold. It all comes down to taste and preference and what compliments your style and fashion. 1. Always remove your jewelry while doing any household work. Any bleach, chlorine, or other strong household cleaning products can permanently discolor your gold and silver jewelry. While working out in the yard or playing sports, it is best to leave your jewelry in a safe and secure spot. Although diamonds are one of the strongest stones they can get dislodged from their setting or even chipped from a hard blow. 2. You don’t actually need to buy all sorts of expensive machines to make your jewelry shine. 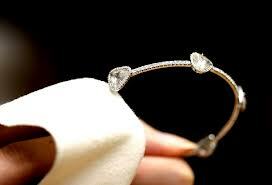 Believe it or not a little bit of soapy water and a soft bristled toothbrush will bring life back to your diamond. Gold is very tarnish resistant; however, it can get smudged and dirty. Every so often clean your gold and platinum jewelry with a mild detergent and use a non-abrasive brush to scrub them clean. 3. Silver is very different from gold or platinum because it will tarnish from oxidation. Oxidation is what happens when silver comes into contact with oxygen. This will cause a gorgeous piece of silver to tarnish and look black or dirty. Oxidation can be cleaned off easily and inexpensively. Simply use some baking soda on a clean damp sponge and rub it onto the silver. Rinse it off in warm water and polish dry with a soft clean cloth. For very tarnished silver allow the baking soda to sit on the silver for a while before rinsing it off. 4. Fine cultured pearls with lustrous nacre will last for generations if cared for properly. Cultured pearls should be kept free of perfumes, cosmetics, perspiration and dirt. It is best to follow the old adage “pearls should be the last thing you put on and the first thing you take off.” You may gently wipe cultured pearls with a slightly damp cloth. Cultured pearls are strung on pure silk with knots between each cultured pearl. Over time, the silk will stretch, weaken and become soiled. If you wear your cultured pearls regularly, we encourage you to have your cultured pearls cleaned and restrung every few years. It’s always good to have your fine jewelry looked at by a jeweler at least once a year to be sure all the stones are tight and secure. Studies show that a diamond can appear colorless and flawed if there is even a little dirt built up in the setting by not allowing the light to refract properly. After all whether you wear your jewelry for its sentimental reminders or just for sheer beauty, a couple minutes of cleaning can make all the difference. It’s summer time in the fashion world, which means lots of preparing seasonal trends for all kinds of weather and occasions, and jewelry isn’t any different! Each year, we see numerous styles fly off the shelves only to disappear into hiding the following year. Whether you are regretfully thinking about the few hundred dollars you spent on last year’s ‘must haves or debating how to make-over your jewelry box, let us help you figure out how you can cash in on old purchases. In order to project the value of your older baubles, it’s important to know your karats! The purity, also known as the amount of karats in an item, will determine the value a retailer might pay for it. Fourteen karat gold is 58% pure while eighteen karat is 75% pure. Platinum jewelry is ordinarily 90 or 95% pure and is a completely different metal than gold (with a different value). Knowing what you have before presenting it to a retailer for sale could be the difference between walking away with a few extra bucks or making a worthy exchange for your possessions. To find up to-the-minute pricing of precious metals, you can always refer to www.kitco.com. If you have an item that no longer appeals to you, try to find a merchant who sells what you are looking to get rid of, perhaps even the same place that you purchased it from originally. Rather than selling your item as ‘cash for gold. When a merchant can offer an item for resale, they may pay higher than just the gold melt value. Another way to maximize value is to bring a number of items you want to sell at one time. Just as in negotiating a purchase when buying a large quantity of an item, you can often bargain a better deal when selling a number of pieces. A retailer might forgo the profits on one item as long as he may profit on another item. Another tip, if you frequent the retailer to which you are selling your items, negotiating store credit for your sale could increase your negotiations by fifty percent. Lastly, make sure that you seek out a reputable place to sell your treasures. Anyone licensed to buy gold will have a license both from the state and local municipality. There should be a blue sticker on their scales signifying that it has been checked and verified by the weights and measures. Daily prices for gold as well as all licenses should be displayed prominently. When you finally make your decision to sell, we suggest that you have an idea of what you want to spend your new earnings on. Whether you were hoping to pay off bills or treat yourself to something new, stay committed to your initial idea of where the money is going so that it ends up taking the value as a meaningful purchase and not just found money only to be lost again. Always Follow these 5 steps.